UNAVCO has just unveiled its new Strategic Plan, a document that will guide the organization's activities over the next five years. After a one year planning and revision process led by UNAVCO President M. Meghan Miller, a full color version of the plan that includes many new community graphics was distributed at the American Geophysical Union's Fall Meeting in San Francisco December, 2008. The Strategic Plan offers a new mission statement for the organization: UNAVCO, a non-profit membership-governed consortium, facilitates geoscience research and education using geodesy. 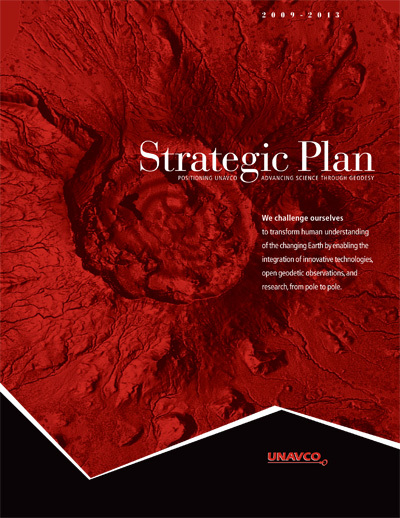 The plan also presents seven strategies that will position UNAVCO to advance geoscience research and education, and reestablishes UNAVCO's primary work of providing support to the scientific community through planning, equipment acquisition and sharing, engineering and data services, and education and outreach activities. Highlights from the Strategic Plan include an emphasis on UNAVCO's role in supporting an expanded use of geodesy and integration of new communities across science disciplines, which will include atmospheric science and hydrology. UNAVCO will continue to integrate and strengthen the InSAR and LiDAR communities. The development of a coherent, modern geodesy curriculum and a continued focus on student internships such as the successful RESESS (Research Experiences in Solid Earth Science for Students) are also planned. As UNAVCO transitions into operations and maintenance phase of the now completed Plate Boundary Observatory, the organization will explore opportunities for international and global applications that build on Plate Boundary Observatory and EarthScope capabilities. UNAVCO will also work to cultivate new funding sources in support of the organization's mission and enhance its role as a leader within the community in order to support future growth. UNAVCO looks for new ways to collaborate in support of our mission. Please contact UNAVCO President M. Meghan Miller (meghan unavco.org) to discuss your involvement in the next five years of UNAVCO initiatives. Figure 1 - UNAVCO's new Strategic Plan can be found online. Simply click on the image above to access the full color PDF.